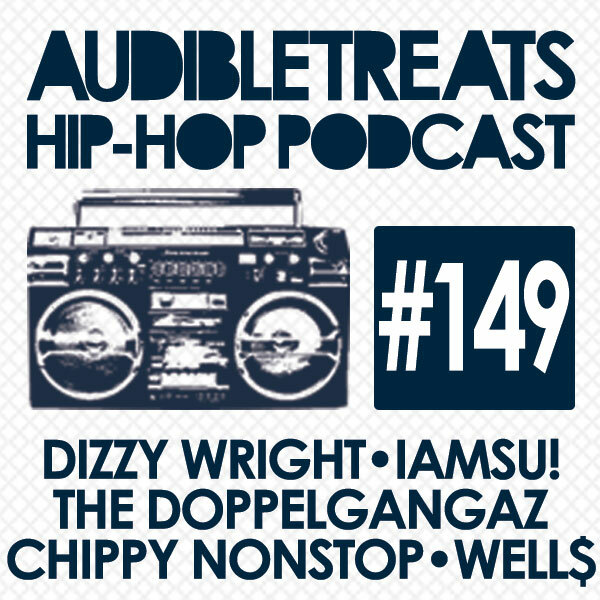 New Audible Treats Hip-Hop Podcast 149 Features Dizzy Wright, Iamsu!, The Doppelgangaz, Chippy Nonstop, Well$! In order to kick off your 2014, Audible Treats presents the latest Hip-Hop Podcast, which brings you some incredible new tracks from our artists’ latest and greatest albums and mixtapes. Leading off is Well$, a rising young rapper from Charlotte, who shows off his impressive talent in “Black Swan.” Next up, West Coast producer/rapper Iamsu! and the HBK Gang deliver a dynamic, playful hit off of their widely-acclaimed Gang Forever mixtape. “Never Goin’ Broke,” which features Kehlani alongside HBK members Kool John, Jay Ant, and Skipper, shows us that Iamsu! doesn’t plan on slowing down this year. Along with announcing their upcoming album titled Peace Kehd, The Doppelgangaz throw down lead single “Holla x 2,” which features signature uses of quirky punchline rhymes. Chippy Nonstop progresses away from her party trap style and offers a brand new sound in the distinctive new track “Alone.” Rounding out this week’s episode, Dizzy Wright, a XXL Freshman Class of 2013 member, celebrated his 300,000 like on Facebook by dropping a new track, “No Writers Block, I Like to Rap.” Stay tuned for our next podcast.